The Social Marketeers Review - Read This Before Buying! We tested the SoundCloud Plays service of The Social Marketeers to see how well they can deliver their services. Our 1,000 Plays arrived very fast, the same day we ordered them. We were very pleased with our experience, as they have friendly and responsive customer support along with good protections. 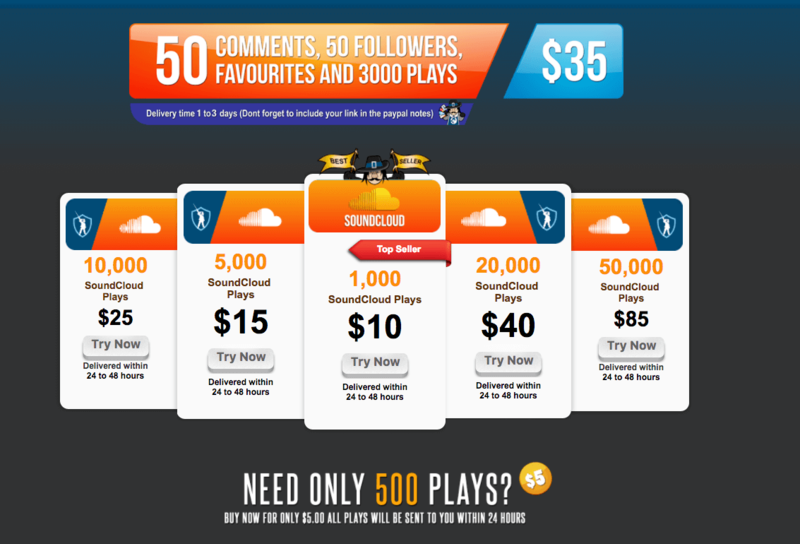 Overall, we recommend them for any musician who wants to improve their social proof on SoundCloud. Located in Surrey, UK, The Social Marketeers is a marketing company that has grown since its launch in 2010 to offer not just social media boosting services but also web design, pay-per-click, and online reputation management. This company offers services for a pretty incredible number of platforms, more than any site we’ve seen. They offer boosting services for YouTube, SoundCloud, Twitter, Instagram, Pinterest, Vimeo, Tumblr, Amazon, IMDB, and there are even more than that. For SoundCloud, The Social Marketeers supplies SoundCloud Plays, Downloads, Reposts, Followers, Favorites, and Comments. We reviewed the terms and conditions sections on the The Social Marketeers website and made a few comments on their status below. To find out more details on these, then please toggle the sections to see what we thought! The Social Marketeers has a standard Terms of Service. They do not sell, trade, or share your personal information with others. They may use your Email to send you updates on your order. The Social Marketeers offers refunds in full or in part. They offer full refunds when no delivery was made within 48 hours after the order was placed. They offer partial refunds when the order is not completed on time. They may refuse the refund if request was made 45 days after purchase. The Social Marketeers has no Retention Policy for SoundCloud Plays. You can get in touch with The Social Marketeers easily, through the Contact Us link at the top-right. They have a number of contact methods available, including on-page contact form and live chat. 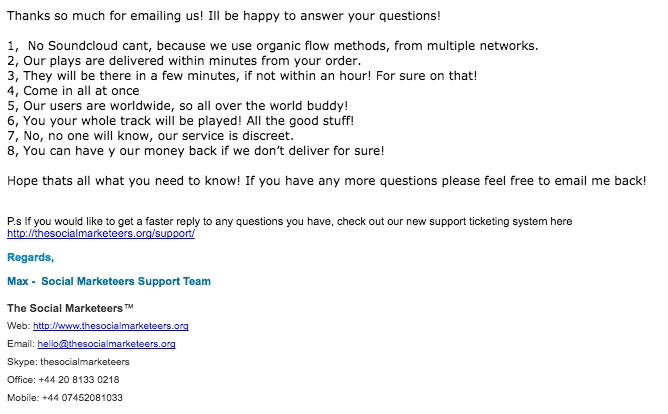 Before ordering, we sent them a set of questions to test their customer support. They got back to use quite quickly, with a friendly and informative response. As you can see, they answered our questions very well. "No Soundcloud cant, because we use organic flow methods, from multiple networks." "Our plays are delivered within minutes from your order." "They will be there in a few minutes, if not within an hour! For sure on that!" "Come in all at once." "You your whole track will be played! All the good stuff!" "No, no one will know, our service is discreet." "You can have your money back if we don't deliver for sure." 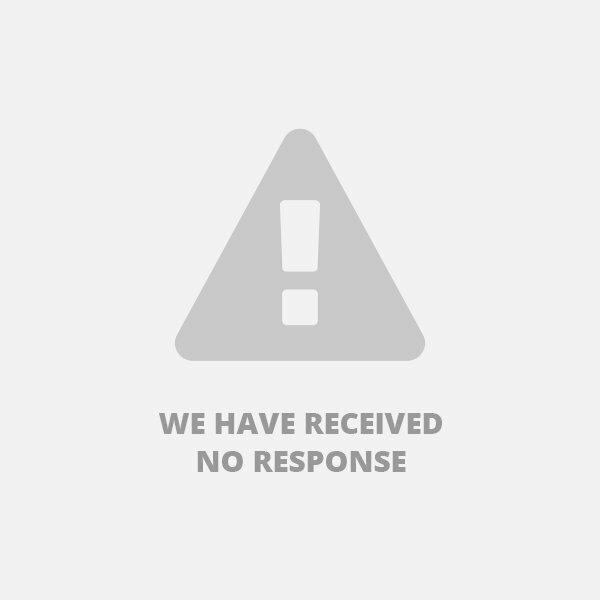 After our order finished, we sent another set of questions to test their response to a paying customer. We'll update this section when we get a response. We recommend The Social Marketeers for any musician on SoundCloud who wants to improve their reputation with bought Plays. As you can see, our Plays from The Social Marketeers arrived quickly and in full, the same day we placed our order. The Social Marketeers delivered our 1,000 Plays quickly and without any hassle, exactly as promised. We didn't get any other social signals along with it, like comments or reposts, so you'll have to order those along with your Plays if you want the service to look more natural. Customer support was very responsive, answering our questions quickly and with good information. They also have a solid refund policy in case anything goes wrong. According to our experience, The Social Marketeers can help artists on SoundCloud improve their social proof and gain more fans. My 5000 plays were delivered in 36 hours in full. The customer support was very helpful ensuring everything went on without any hitches. My sound cloud following has since grown remarkably. A warm and knowledgeable customer support was all it took to get me hooked and purchase their plays. The plays too were of good quality and came in good time. The plays i ordered were delivered in time same day. Its been a month now since and i have seen a tremendous increase in my soundcloud following something i attribute to the services i got from the socialmarketeers. I signed up for their SoundCloud followers service, and this went forth to result in almost doubling my follower numbers in the two months thaf followed, all organically. Social marketeers managed to get me a few hundred subscribers for my new SoundCloud channel. That for me is great! Skeptical at first as I wasn't sure of how it could turn out as I was so in need of building my following on SoundCloud. The socialmarketeers gave me a reason to believe in them.